The start of each new year brings a lot of “new-ness”. New exercise goals (at least for the first couple weeks), new fad diets (Eric is currently on Whole 30… and experiencing severe sugar withdrawals as a result), and a new round of price increases on brand-name drugs. This year has been no exception, and the media has been all over the subject. Unfortunately, we’ve found it difficult to figure out the “so what?” behind all of these price increases. On one hand, we are being told that the pharmaceutical manufacturers are back to “business as usual,” while on the other we are being told that the number of price increases are down meaningfully from last year. Which one is it? This felt like an opportunity to inject a healthy dose of facts into this discussion. 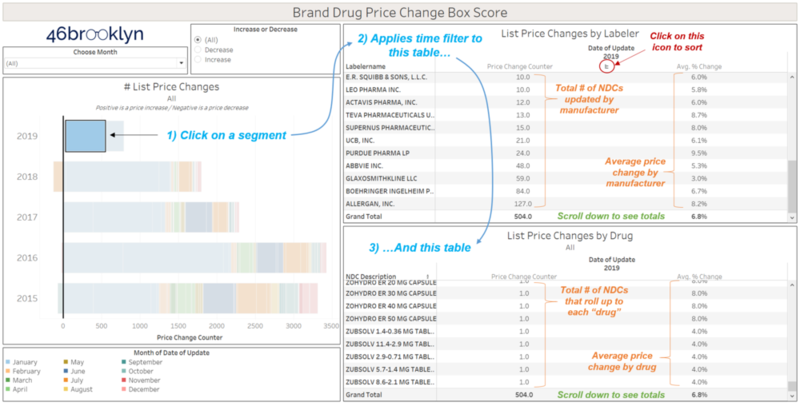 So we set out to build a dashboard, 46brooklyn’s Brand Drug Price Change Box Score, that lets you visualize all brand-name manufacturer list price changes that are publicly-reported each week, drill down to the manufacturer and drug level, strength level, and compare and contrast different periods. Unfortunately, list prices are only one part of the story – any discussion of brand drug prices absent (hidden) rebates is grossly incomplete. As such, this tool cannot be used to draw any conclusions on changes in manufacturer revenue/profit or PBM revenue/profit. All it should be used for is to help drill into changes in list prices. Given this substantial limitation, you may ask, “why create this dashboard?” Because it’s quite clear that any drug pricing information out there – no matter how incomplete – is going to get scrutinized. We figured we may as well make this process more transparent and efficient. So, consider this new viz our first stab at providing a more complete picture of incomplete data. Figure 1 shows a screenshot of the new tool, which you will now find linked on our Visualizations page along with our other dashboards and tools. Click here to interact with the Brand Drug Price Change Box Score directly. The remainder of this report steps through what you need to know to get the most value out of the tool. 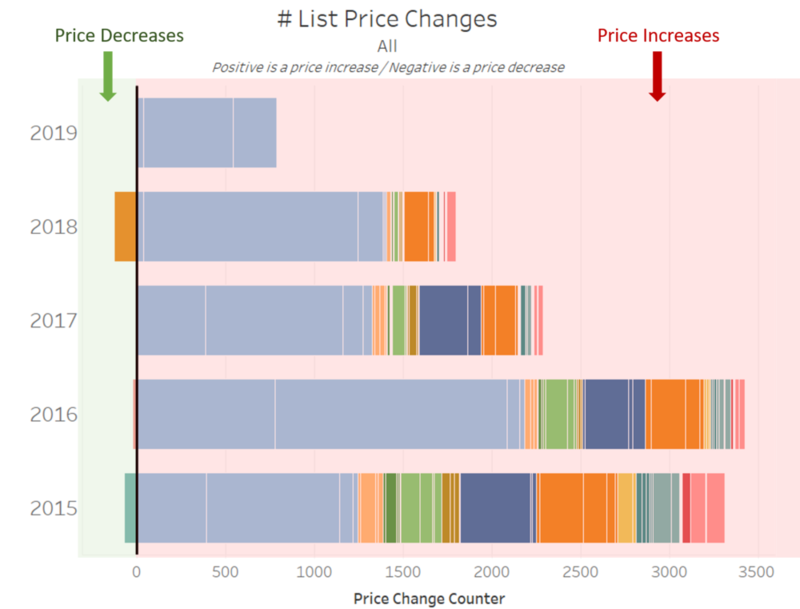 The first thing to understand about this visualization is that much like a box score aims to tally up the hits and runs by players in a baseball game, this tool aims to tally up the number of price increases and decreases reported by manufacturers each week. That leads to the next question of what we are actually counting. We are counting changes to unique National Drug Codes (NDCs) each week in the field we call “Price Change Counter.” If an NDC increased in price, we set Price Change Counter = 1, if it decreased in price we set Price Change Counter = -1. That allows us to simply sum up all the records to arrive at the net number of list price increases in any given period. It is critical to note that this tool does not size the price changes for brand-name drugs, as we do for generic drugs in our NADAC Change Packed Bubble Chart (using Medicaid’s drug utilization). We plan on getting to that in the future … but for now, we are just counting the changes of each strength of every drug. It also does not include manufacturer rebates and other associated manufacturer price concessions to PBMs, as that information is not public. There’s more discussion on all of the tool’s limitations later on in this report. The dashboard all starts with the Price Change Bar Chart positioned on the left side of the visualization. Shown in Figure 2, this chart presents the number of NDCs that experienced a reported price change each year. Numbers to the right of the zero line are price increases while numbers to left of the zero line are price decreases. You’ll notice that each individual series is comprised of many segments (“stacks” within the stacked bar chart). Each of these segments represents one individual weekly pricing update. As shown in Figure 3, you can hover over any one of the segments to see the date the update was posted, number of NDCs that were increased/decreased, and average percent change for that week’s update. We have arranged all of the segments chronologically by update throughout the year. In other words, the left-most segment is the first update in January, and the right-most segment is the last update of the calendar year. The colors represent the calendar month (Figure 4). Organizing the data in this manner made it easy for us to quickly see when prices were changing throughout the year, and quickly eyeball how one year compared to another. You can also choose to view the bar chart for any individual month, or selection of months (as opposed to all months at the same time) by selecting one or multiple months from the “Choose Month” dropdown filter (Figure 5). You can also filter down to just those drugs with price increases or decreases using the “Increase or Decrease” radio button filter. Please note that when you choose to view only the price decreases, the segments are organized in reverse chronological order (Figure 6). Now that you are familiar with how to use the bar chart, we can get to the fun part – price changes by manufacturer and drug. When looking at the dashboard, you will find two tables on the right side. The top table presents the number of price changes by “labeler” (which for brand-drugs is a good proxy for manufacturer. This is not necessarily the case for generic drugs as we described in detail here). The bottom table presents all price changes by “drug,” where we define drug as a group of NDCs that have the same active ingredient, strength, and dosage form. To update these tables, simply click on any segment in the bar chart and both will filter to the selected period – in other words, you will be able to see all of the changes that occured in the selected period by manufacturer and drug. Scroll to the bottom of each table to see the totals for the selected period. In Figure 7, we have selected the 1/9/2019 update from the bar chart. In this period, there were 504 NDCs that increased with an average increase of 6.8%. To sort any field in the tables, look for and click on the small icon that will appear when you hover towards the right side of the field name. You can then drill down into any individual manufacturer to see which drugs they adjusted in the selected period. Simply click on any manufacturer in the list, and the bottom right table will update with only this manufacturer’s drugs. Selecting the manufacturer will also filter the stacked bar chart on the left to provide you with better historical context on price changes for the chosen manufacturer. In Figure 8, we selected ALLERGAN, INC. to drill into their 1/9/2019 pricing update. This updated the Price Changes by Drug table with the 127 ALLERGAN, INC. NDCs that increased in price in the 1/9/2019 update. We then sorted this table by Average % Change from high to low to bring all of the “heavy hitters” to the top. The bar chart on the left also updated, providing us with historical context on ALLERGAN, INC. list price increases. This quickly shows us that: 1) ALLERGAN, INC.’s list price increases typically occur at the start of the year, 2) 2019 increases are modestly down from 2018, and 3) 2017-2019 increases are considerably lower than 2015-2016 increases, seemingly honoring key portions of Allergan’s Social Contract with Patients instituted in 2016. To remove the filter, simply click again on the same labeler (e.g. in this example, if ALLERGAN, INC. was clicked again that filter would be removed). We’ve also included the ability to filter by drug. Let’s say you were interested in exploring Mylan’s price increases on the EpiPen in 2015. First, you would click on 2015 in the stacked bar chart. Next, find and click on “MYLAN SPECIALTY L.P.” in the Price Change by Labeler list. Then find and click on “EPIPEN 2-PAK 0.3 MG AUTO-INJCT” in the Price Changes by Drug list. As shown in Figure 9, the bar chart will update to show when Mylan instituted price increases on this drug. We can see that Mylan reported two price increases in 2015 (each set at 14.9% – that will show when you hover over the bar) and one more 14.9% increase in May 2016 – the last price increase on record, likely due the controversy over EpiPen pricing. While this appears to be good news, it’s not necessarily an apples-to-apples comparison. We can’t be certain that drug manufacturers report price changes at the same time each year, which could distort the comparison made in Figure 10. That’s why we designed this in a manner where you can Ctrl-click multiple segments in one year to combine them. Let’s say you suspected that a more relevant comparison between January 2018 and January 2019 was to compare price increases reported in both the 1/9/2019 and 1/16/2019 weeks to those reported in the 1/10/2018 week. As shown in Figure 11, we can use the Ctrl-click feature to accomplish this. When we capture both periods in each year we find that there were a total of 749 price increases in the two most recent periods, down from 1,211 in the 1/10/2018 period. However, by sorting on “Price Change Counter” for 2018, we can also see that a handful of the manufacturers that reported the most increases in 2018 have not yet reported in 2019. So we’ll have to wait for a couple more weeks of data for a more accurate comparison. Lastly, you can compare full years versus each other by clicking on the year in the axis of the bar chart (Figure 12). The net number of list price increases in 2018 was 1,666, down 27% from the 2,289 net increases in 2017. The average list price increase in 2018 also declined – down to 6.5% from 8.1% in 2017. While you can select more than two years to compare, we do not recommend doing so because there isn’t enough “real estate” in the visualization embedded on 46brooklyn to display this properly for you. However, there is a workaround if you really want to view more than two years at the same time. Simply work off of the version posted directly on Tableau Public, which will give you some more space to pull more data. You can also download data from any table by clicking on the share icon at the bottom right of the visualization. This tool was produced with 100% free, publicly-available data. This was a necessary requirement of this work to ensure that we could freely provide this visualization to the public. All raw data lives in the NADAC Comparison Data section of the Pharmacy Pricing site on Medicaid.gov. This information is painstakingly assembled by Myers and Stauffer each week on behalf of the Centers for Medicaid & Medicare Services (CMS). The database is designed to capture and report all changes in price that occurred over the prior week. Within this database you will find a field called “Primary Reason.” This field tells us what prompted the update. When we evaluate changes in generic prices, we filter this list to “Survey Rate” to understand prices that are changing based on true changes in pharmacy invoice price each month. For this application, we instead filtered the database to “WAC Adjustment.” Myers and Stauffer is doing all of the heavy lifting here – they are combing through the drug pricing compendia (e.g. MediSpan, First Databank, Elsevier Gold Standard) for all reported changes to Wholesale Acquisition Cost (WAC) and updating their weekly NADAC Comparison Data file with the changes. What are the Dashboard’s Limitations? This tool is a reflection of the WAC adjustment information provided to the public, as published weekly on Medicaid.gov. We heavily rely on the extensive work performed by CMS and its contractors to collect and report all pricing changes. If for any reason CMS’ process does not capture all brand-name price changes reported, we will be missing these price changes as well. Drugs that are not in the NADAC database will be missing from this tool. According to CMS and Myers and Stauffer, as of 2017, NADACs were calculated for 87% of all Medicaid brand claim submissions. Not to be overly nitpicky of the outstanding work being provided in these data files, but it would be extremely beneficial for the public to have a more robust, complete database that fills in the missing outliers. To bring the labeler field in to the database, we are performing an inner join between the price change database and the FDA’s NDC tables. For some reason there appears to be times where NDCs in the price change file are not present in the latest iteration of the FDA’s NDC tables. When we do not find a match, we are excluding these records, which means our count of price increases/decreases will be slightly below the exact number reported by CMS. It would be very helpful for the feds to come up with some better standardization across agency databases. We grouped manufacturers that are now part of the same parent company (to the best of our abilities) based on current ownership. As an example, Wyeth, Pharmacia & Upjohn, and Roerig has been rolled up in Pfizer across all data. Please contact us if you see any classification errors, and we will promptly fix them. All periods presented in the tool reflect the week the drug price increase/decrease was announced – not its effective date. Announcements can at times occur months before or after the actual effective date. Most importantly, the list prices captured in this tool do not reflect the impact of rebates. We cannot overstate the importance of this limitation. Rebates and other pricing concessions negotiated between manufacturer and pharmacy benefit manager (PBM) are sizable and hidden from the public’s view – and this “gross-to-net bubble” continues to grow. This tool cannot be used to derive increase in manufacturer revenue/profit or PBM revenue/profit. All it should be used for is to help drill into changes in list prices. Just to give you sense of how important it is to not use a list price to gauge actual costs to the system, look no further than Pfizer’s recent announcement regarding their planned 2019 price increases. Pfizer states that their “list price increases are expected to be offset by higher rebates and discounts paid to Insurance Companies and Pharmacy Benefit Managers and the net effect on revenue growth in the U.S. in 2019 is expected to be zero.” So it follows that without visibility into rebates, we really do not have any insight into true net pricing changes. We recognize that net prices are the most relevant metric to track, but in lieu of that data, and recognizing so much media focus on list prices, we feel that it is important to provide as much historical context and as many apples-to-apples comparisons as possible, recognizing the inherent incompleteness of the sticker price reporting. I’d like to do my own analysis on this Subject. Can i have your database? Good or BAD? You decide. What we’re sensing from the newsflow on this very controversial topic is that different people have different views on what a “good” outcome is when it comes to changes in drug list prices. As such, we purposely designed this report with a much different goal in mind. We see little value in opining on whether the early-2019 pricing movements are good or bad. Good and bad are inherently relative concepts – they do not exist without some sort of an expectation. Even if we did want to pass judgement on this topic, the lack of rebate information makes it essentially impossible for us to do so in a fact-based manner. So, we’ll leave it to you to assign the label (if you are brave enough to do so). The good news is that we at least now have a more comprehensive view of the data to help facilitate more productive discussion on this topic. We designed this dashboard to provide you with the facts you need to form a more educated opinion on the nature of drug list pricing movements. And more importantly, we now have the ability to drill down to gather more information on what drove these changes. As always, please don’t hesitate to reach out with any questions on the tool or suggestions for enhancements.